Do you need to place a sign within a yard, on a fence, pole, tree, maybe in a window or more? Then these security signs should do the trick. 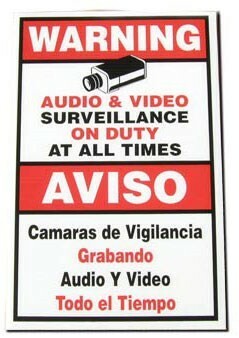 These plastic, weather resistant security yard signs are available in two sizes, 9x6 inches and 12x18 inches. And best yet, whether you want to ward off the English or Spanish speaking community -- it doesn't matter, as you're able to even address the illiterate via our picture of a surveillance camera. This one is the 18x12inch sign. 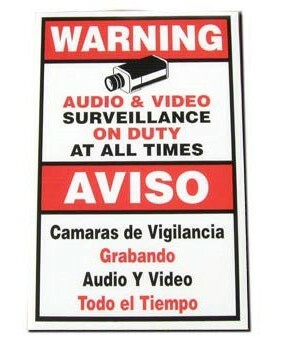 We also have a 9x6 warning sign.